پژوهش حاضر با هدف کلی تحلیل عوامل بازدارنده انتقال مدیریت شبکه‏ی آبیاری به بهره‏برداران انجام شد. جامعه آماری پژوهش شامل تمام بهره‏برداران شبکه آبیاری ناحیه عمرانی D2 میان‏دربند شهرستان کرمانشاه بودند (N=417). با استفاده از فرمول کوکران تعداد 126 نفر از آن‏ها به روش نمونه‏گیری طبقه‏ای تصادفی با انتساب متناسب برای مطالعه انتخاب شدند. ابزار اصلی پژوهش برای جمع‏آوری داده‏ها پرسشنامه‏ای بوده که روایی آن بر پایه نظر جمعی از کارشناسان سازمان آب منطقه‏ای کرمانشاه و اعضای هیأت علمی گروه ترویج و توسعه روستایی دانشگاه رازی تأیید شد و پایایی آن با محاسبه ضریب آلفای کرونباخ تأیید گردید (α=0/85). تجزیه و تحلیل داده‏ها با استفاده از نرم‏افزار SPSSwin20انجام شد. نتایج حاصل از تحلیل عاملی اکتشافی عوامل بازدارنده انتقال مدیریت شبکه‏ی آبیاری به بهره‏بردران را در 9 عامل، فردی، مدیریتی، اجتماعی، حمایتی، اقتصادی، فرهنگی، آموزشی- ترویجی، زراعی و فنی طبقه‏بندی کرد. نتایج این مطالعه دستاوردهای مناسبی را برای نهادهای درگیر در کار شبکه‏های آبیاری و برای انتقال مدیریت شبکه‏های آبیاری به بهره‏برداران دارد. The main purpose of this study was analyzing the inhibiting factors of transferring the irrigation network management to beneficiaries. 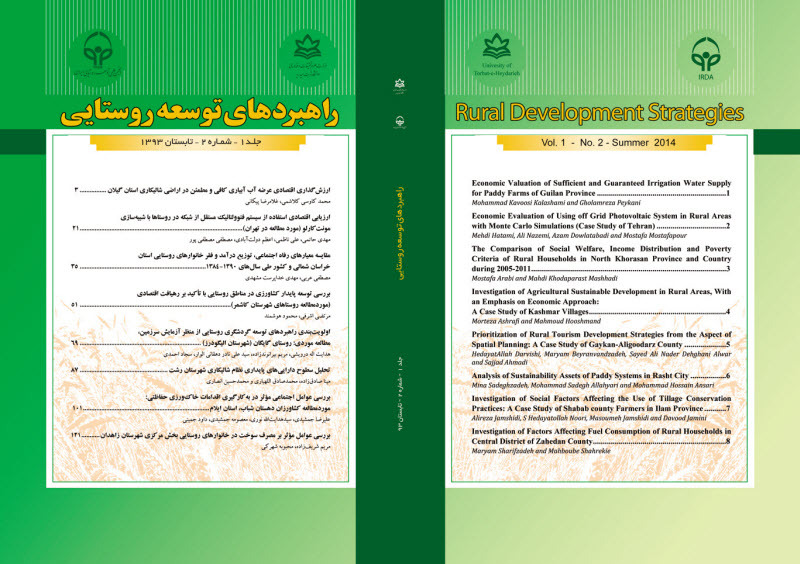 The research population consisted of all beneficiaries of the irrigation network of the civil district D2 of Miandarband Villages located in Kermanshah province, Iran (N = 417). By using the Cochran's formula, 126 people were chosen through a random stratified sampling method with appropriate attribution to the study. The main instrument in this study was questionnaire which its validity was obtained by Regional Water organization expert of Kermanshah County and panel of faculty members of extension and rural development in Razi University. To measure reliability of questionnaire Cronbach's Alpha formula calculated (α=0/85). The results of the exploratory factor analysis classified the inhibiting factors of transferring the irrigation network management to beneficiaries in to nine factors that includes: individual, managerial, social, supportive, economic, cultural, educational- extension, agricultural and technical .The results of this study offers suitable achievements for the institutions involved in the work of irrigation and irrigation management transfer to beneficiaries.